September 19, 2012 – You can already view your device calendars (iPad and iPhone Calendar app) items in various views in LifeTopix, such as in What’s Next (Home), in My Calendar, and in the Events topic. But did you know that if you tap and hold on a device calendar item, you can convert that into a LifeTopix item (tasks, appointments, projects, trips, etc.)? An example – let’s say you are working on a Kitchen Remodel project that you are tracking in LifeTopix. As you are scheduling deliveries of material, let’s say you had created the delivery of the new kitchen sink in your device calendar. But now you wish it to be a task in your Kitchen Remodel project in LifeTopix, so that you can more accurately track all the steps in the project. No problem! 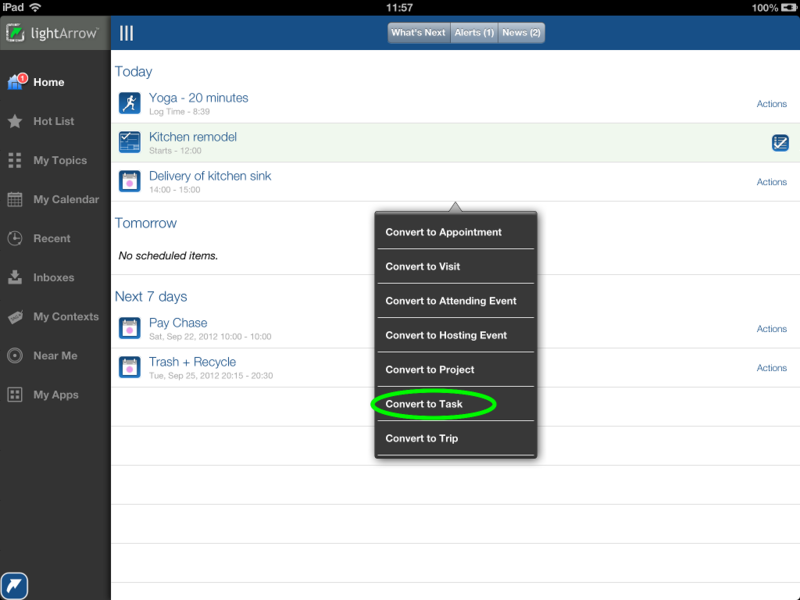 Just tap and hold on the device event visible in your LifeTopix view, and you can easily convert it into a task, and then associate that task with your project. Voila!